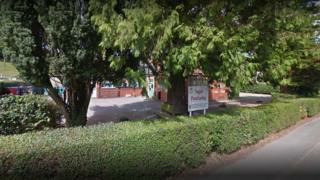 A primary school is to shut after it was deemed "no longer sustainable", despite more than 1,300 objections. Wrexham council voted to close Ysgol Pontfadog due to low demand for English-speaking schools in the area, saving an estimated £100,000. Campaigners have called on Education Secretary Kirsty Williams to overturn the decision. Pupils will move to Ysgol Cynddelw, a bilingual school, when Ysgol Pontfadog shuts in August 2019. Parents and pupils, among others, attended the council debate on Tuesday to raise issues about the proposal. Campaigner Jools Payne, a former governor, said the report "spits in the face of local democracy and localism". "It's a predominantly English-speaking area," she added, saying pupil numbers were only low because parents feared the school was earmarked for closure. Campaigners now plan to complain to the Public Services Ombudsman for Wales and are considering applying for a judicial review, Ms Payne said. The closure was offered as an option in a Wrexham council consultation into the future of education in the Ceiriog Valley. Lead member for education Phil Wynn said there was a "clear demonstration" of increased demand for Welsh-medium places and understood the issue was "emotive," but denied not all objections had been considered equally. Ceiriog Valley councillor Trevor Bates said to close the school was to "disregard the feelings of current and future pupils and parents". MP Susan Jones said the decision was "appalling". "A huge number of people took part in the council's consultation process and local campaigners are right to be furious," she added. "Ysgol Pontfadog should have been retained as an English-medium school, Ysgol Llanarmon DC as a Welsh-medium school with Ysgol Cynddelw, Glyn Ceiriog becoming a fully Welsh-medium school."